Reading the Fantastic Four comics from the start. 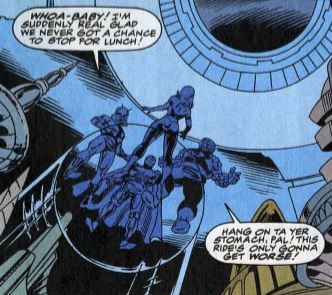 Now that all the excitement of issue #400 is over, we’re at issue #401, smack-dab in the middle of yet another convoluted ‘90s Marvel crossover. This is part eight of the eleven-part Atlantis Rising crossover, in which Atlantis rises to the surface thanks to Morgan Le Fay’s magic. Meanwhile, the Inhuman’s moon-based city of Attilan is rocked with earthquakes, so the Inhuman genetic council decides to invade Atlantis, claiming it for their own. Various Marvel superheroes get caught up in the conflict. The FF used Ant-Man’s shrinking tech to shrink all of Attilan to save the city. Then, Maximus the Mad swept in and shrunk the FF, trapping them in the tiny city. 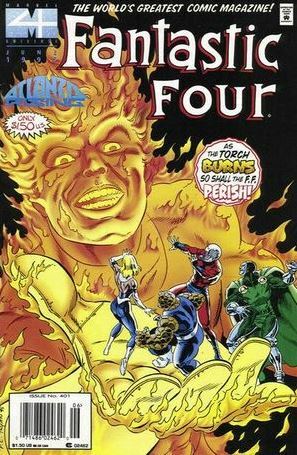 This issue begins with four of the currently five FF — Sue, Ben, Ant-Man and Kristoff — fighting Inhumans in Attlilan, while Maximus has Johnny trapped in a “brain transcendentalizer,” reprogramming Johnny’s brain to make him loyal to Maximus. Then there’s several pages of Atlantis Rising tie-in plot, where Morgan Le Fay and the Inhuman Genetic Council work out an uneasy alliance. Thor, who is under Morgan’s thrall, wants to fight, but she calms him down, saying she will work with the Inhumans but won’t surrender Atlantis. Aboard the FF’s spaceship the Stealth Hawk, Maximus outlines his plan, saying he’s going to sneak the shrunken Attilan into Atlantis, and then restore all the Inhumans to regular size and have them attack, so he can be the one to rule Atlantis. Kristoff’s servant Boris is also there, with more hints that he is keeping a secret from everyone. The FF, meanwhile, reach the top of the dome containing Attilan and break free. But they are all still Ant-Man sized, and are spotted by one of Maximus’ goons. Then more tie-in plot, where some Atlantean soldiers find Namor the Sub-Mariner still alive after his fight with Prince Llyron in an earlier Atlantis Rising tie-in. In Latveria, Nathaniel Richards still has the world convinced the world that he’s Doctor Doom. 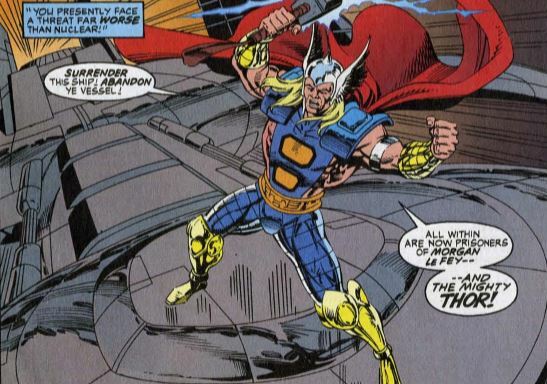 After monitoring the Atlantis situation, he dons a “vibro vest” which lets him turn invisible, and then he teleports on board the Stealth Hawk. There’s several pages of action as the Inhumans chase the teeny-tiny FF around the ship. Maximus turns the tide unleashing Johnny, now loyal to Maximus, to destroy the FF. Aboard the Stealth Hawk, the FF put up a good fight against Johnny and Maximus’ henchmen, despite their size. Nathaniel tries to steal Attilan, only for Johnny to catch him in the act. Nathaniel teleports away, accidentally taking Johnny with him. Ant-Man manages to reach his enlarging gas, which restores the FF to regular size. Just as they are about to clobber Maximus, the whole ship is rocked. Cut to outside, where Morgan Le Fay sent Thor into space to destroy the ship. Fade out: Sue lifts the team to the highest point of Attilan on a force field, which wears her out to the point of exhaustion, even though we’ve seen her a lot more elaborate stunts with her force fields before. 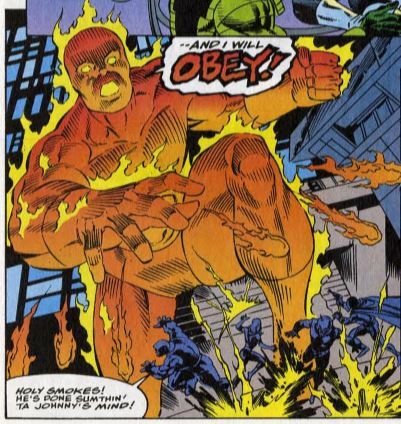 I guess they were fighting Inhumans for a long time before this issue started. Clobberin’ time: Ben uses his smarts while shrunken, to use wires to electrocute an enemy, rather than just punch him. Flame on: Johnny is able to reveal Nathaniel’s invisibility by blanketing the room with heat rays. It’s suggested that he knows this will work on Sue’s powers, though I don’t recall him doing that in the past. Fantastic fifth wheel: Ant-Man is wearing special “boot springs” that allow him to jump to great heights. I guess the compressed-mass-makes-him-strong-when-small thing means he can only super-jump so high without help. Here’s where I can see why so many fans think Kristoff is annoying. He has all of Dr. Doom’s arrogance-speak, but without any of Doom’s menace. He also wants to flat-out murder all the Inhumans they’re fighting, only for the others to remind him more than once that FF don’t kill. If Kristoff has all of Dr. Doom’s memories and genius, shouldn’t he know that about them already? 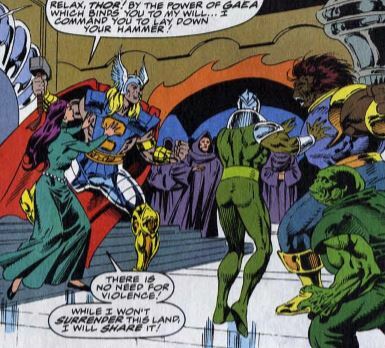 Medusa is back for one panel, doting over Black Bolt as he is ill. Why is he ill? Because of heartbreak over the Inhumans losing their culture and way of life. 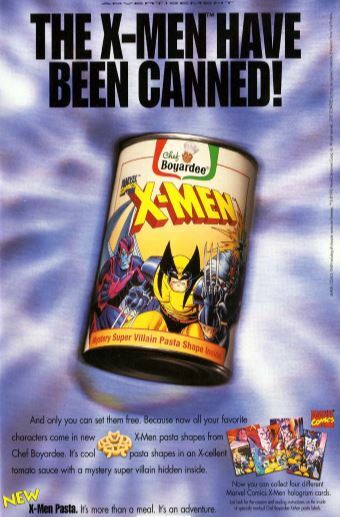 Commercial break: I wish they still made this. 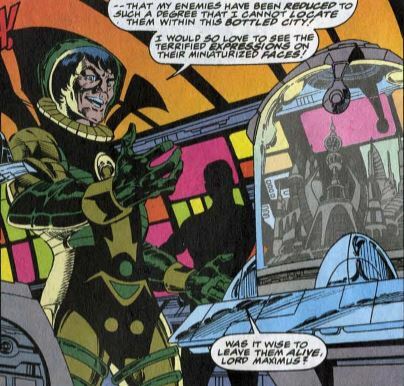 Trivia time: There’s a lot of talk in this issue about Attilan being a city beneath a dome (the Marvel Wiki alleges this is a “parody” of DC Comics’ bottled city of Kandor), hinting that it was always under a dome. It looks to me like the dome was part of the shrinking process, because Attilan was originally relocated to the Blue Area of the moon, because the Blue Area has its own breathable atmosphere. More Inhuman names. 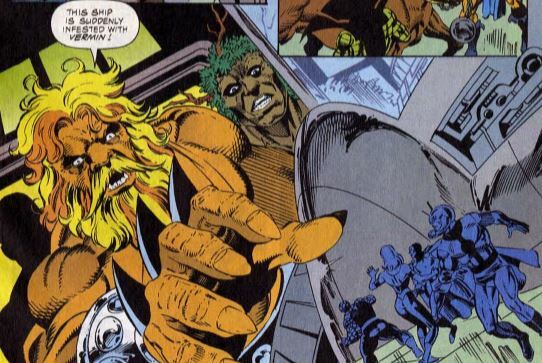 Along with Arcadius, the Inhuman Genetic Council includes Cynas, Porcal, Furgar, Targon, Kitang, and Sapphiras. Maximus’ henchmenm meanwhile, are Nebulo, Leonis, Stallior, and Timberius. Fantastic or frightful? With Ant-Man on the team, it’s about time they did a story where the whole team gets Ant-Man’d. Unfortunately, the fun of this is overshadowed by the overall Atlantis vs. Inhumans plot. So, a mixed bag.